This week we are exploring the "Advocate" personality type! 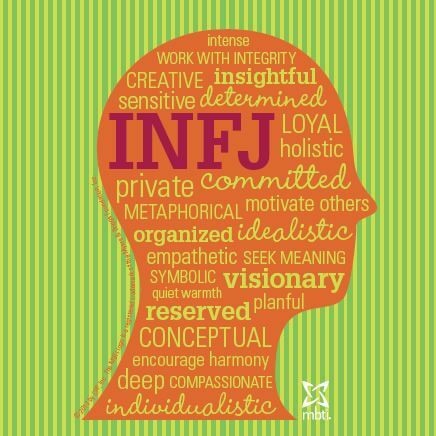 Being the rarest personality type of all 16 types, the INFJ soul is notorious for their deep, complex, introverted perception of the world. This bride is a metaphorical one, always looking for the true meaning of life. Her wedding will be detailed with meaningful elements in every aspect imaginable because of her eye for intellectual creativity. Cate Blanchet, Michelle Pfeiffer, and respected feminist philosopher Mary Wollstonecraft are also rocking the INFJ badge. The INFJ bride genuinely cares for the well-being of others, but you best believe she's a fighter in what she believes in! She knows what it takes to succeed and has been envisioning it long before the rest of us had time to catch up! Here's a tip to the wise, let this bride do her thang! She knows exactly what she wants and how to get it. But it doesn't take much to make this girl happy. The INFJ bride loves to feel accomplished and appreciated which typically takes a lot of hard work. This woman loves control and is skeptical of spontaneous gestures. No surprise parties for this one! Being an introvert, she loves to recharge on her own but doesn't love being alone because they thrive off the emotions of others. This woman's instincts are out of this world! She has a gift for reading people. One of her greatest qualities is her yearn to constantly grow and improve. This bride analyzes everything in terms of big picture and long-haul. Her decisions are valued and will be trusted from those among her. This woman is incredibly talented at self expression. "Bride most likely to recite some of the most beautiful wedding vows imaginable" awarded here! This unique woman really only needs one special person in their life to be content. Her true peace comes from knowing that she is consistently growing and contributing to the world. What better way than marrying the love of your life and living happily ever after.